One of the most frustrating things about capturing wildlife on the water is that you are usually stuck on the shore behind some foliage that hides the wildlife you’re looking for. My solution was to buy a kayak and put the boys in a canoe. We paddle on lakes, rivers and creeks, that have preferably little boat traffic and I take my camera along with me. I use my second camera, the D5000 and my 70-300mm lens. Photography from a kayak can be challenging but it is also very rewarding. I have captured wildlife that I never would have otherwise. I have also learned to take wildlife sightings on the water in stride and enjoy rather than stress about catching everything with my camera. Most of the time they see me before I see them and they are gone in an instant. But sometimes you get lucky and can capture what was unavailable by land. Kemptville is a community located approximately an hour south of Ottawa and a few kilometres south of the Rideau River. Kemptville Creek is a tributary of the Rideau River and flows through several communities, including Kemptville, where there is a public dock to launch small watercraft. I freely admit to being a fair weather kayaker. I love to be on calm water that is smooth as glass, which is also best for taking pictures of wildlife when the opportunity arises. 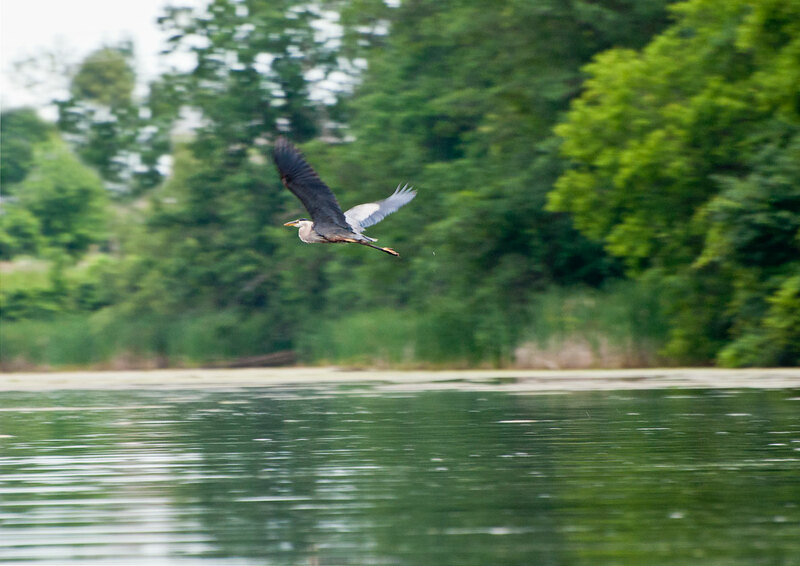 I would like to say that I nailed this shot but in my defence, panning in a moving canoe is somewhat of a challenge. That is, if you want to stay dry. However, I still like this image because its my first inflight catch of a Great Blue and because there is a real sense of movement. 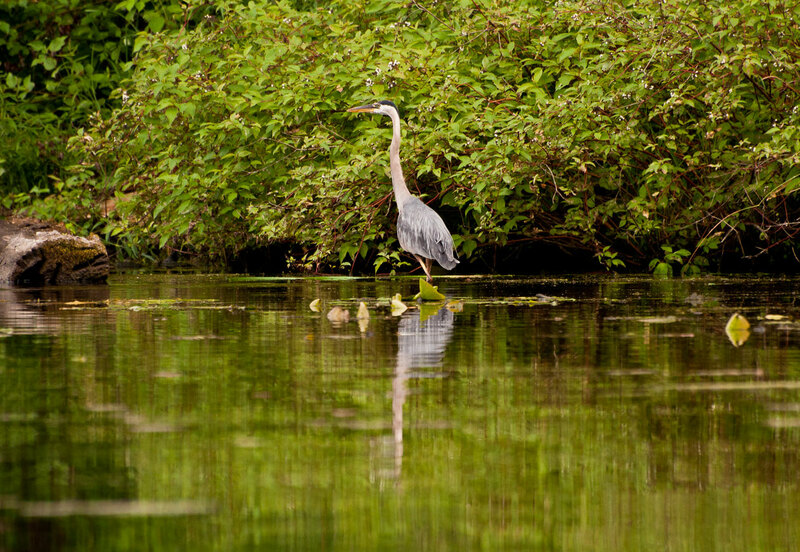 I have often trailed Great Blue herons down a waterway as it takes flight and lands and takes flight again. Usually the first time is before you spotted it. They are amazing at camouflaging themselves along the banks in the foliage. Once they have seen you, they usually take off before you can get anywhere close enough to take a picture. And sometimes they get so annoyed that they turn around and go in the opposite direction that you are kayaking. Which is why I have become very philosophical about being on the river. You want to enjoy nature and not harass the wildlife. 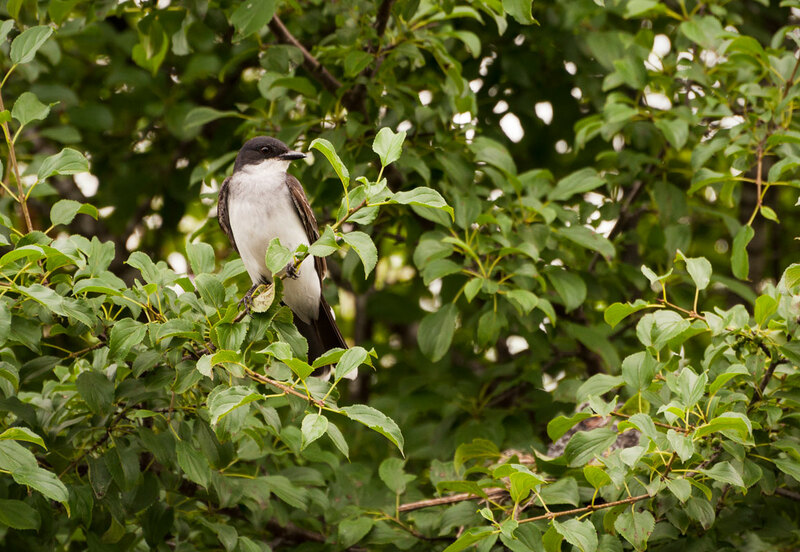 My encounter with this Eastern Kingbird was pretty amazing. I was paddling along, when I heard a racket from the foliage nearby. 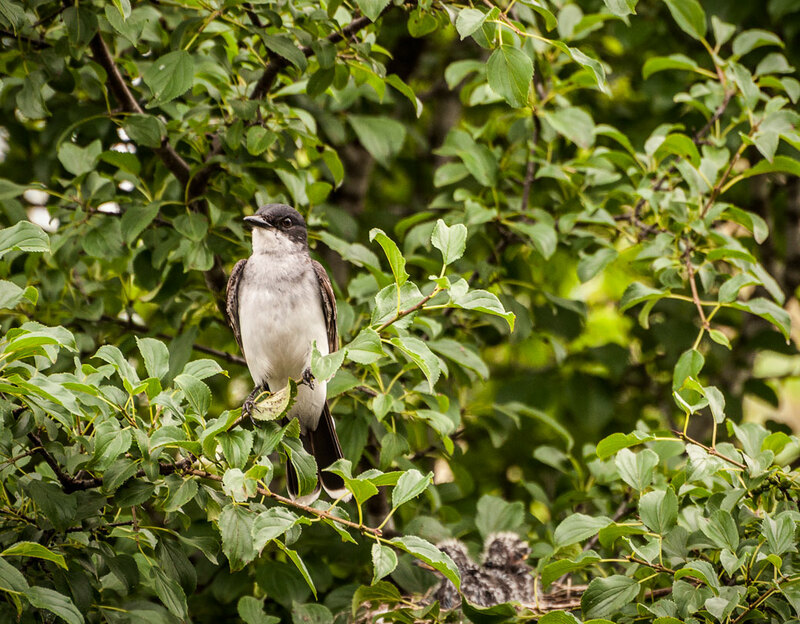 I followed the noise and saw this kingbird on a branch. I quickly got my camera out and gave my kayak a last push in her direction, hoping to get a picture. I got closer and closer taking more pictures and wondering why it was still there. I soon realized that this adult was guarding a nest of chicks hidden in the foliage. The nest was well hidden and I would never have spotted it or been able to get near it except on my kayak. 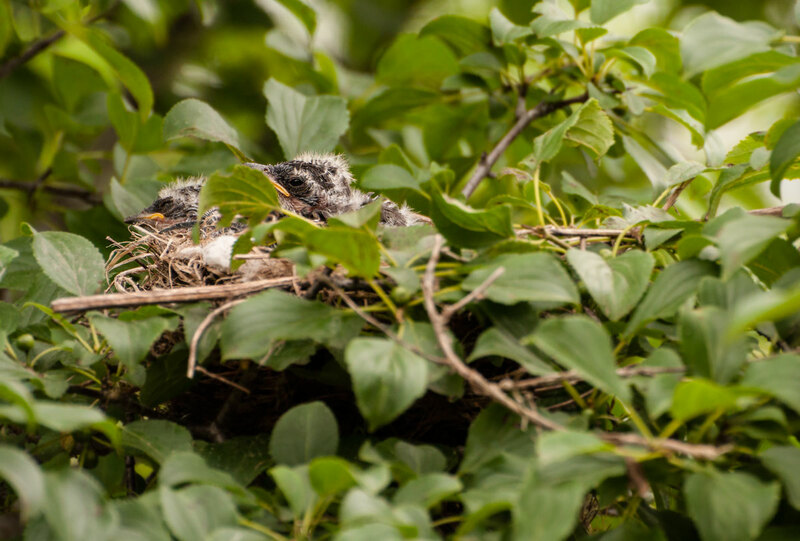 Both male and female Eastern Kingbirds participate in nest defense and are known to rely on aggressive behaviour to protect their young. For once being low in the kayak was a disadvantage. Although I was close and they were over the water, they were up high in the foliage. As tempting as standing up in the kayak was, I had to take the shot from where I was. Framing a better shot was not an option as I like to keep myself and my equipment dry. 🙂 I took what I could get before anyone got to too upset and paddled on my way to catch up with the boys who had left me in their dust. Metaphorically speaking, of course! I tried to take note of where the nest was located so I could try again from a different direction on the way back. I kept an eagle eye out and amazingly enough, I did find it again. However, the parent was gone. The late evening light was fading fast and unfortunately for me, the babies were already sleeping for the night. 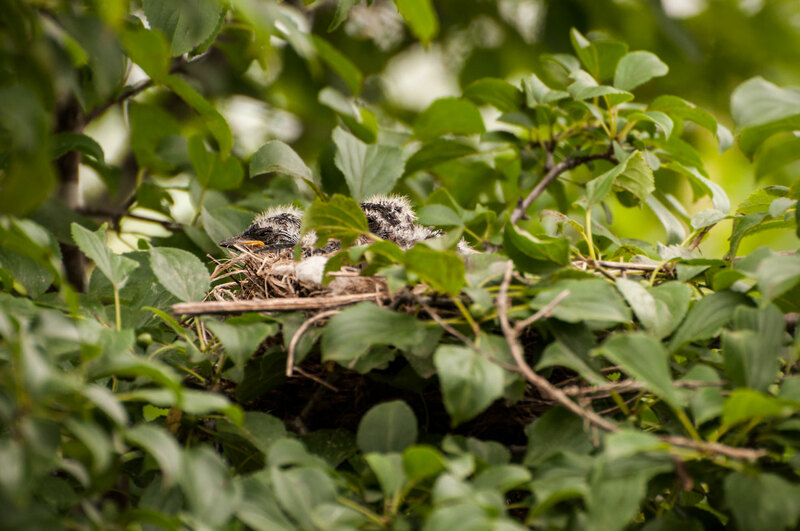 So nobody poked their head out of the nest. 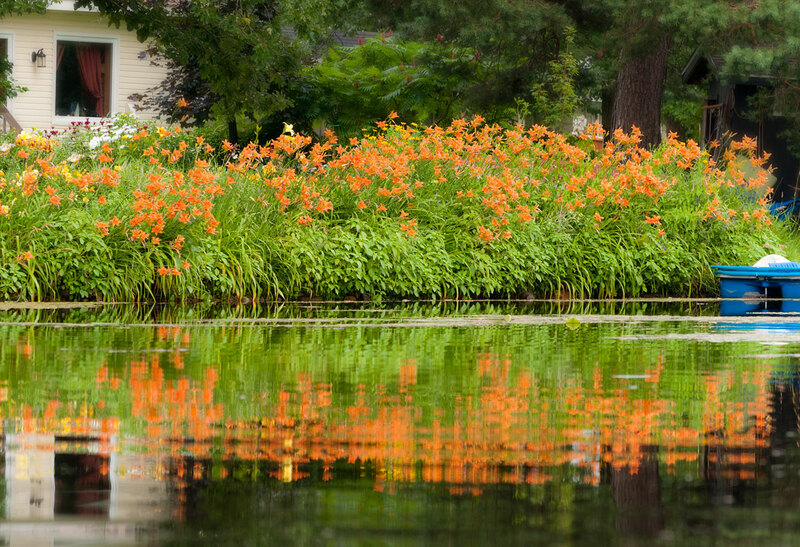 I also saw large bunches of beautiful orange day lilies lining the banks of the creek. It was such a glorious display of colour. Unfortunately we were running out of time and my husband wanted to get back to the car. He did apologize as they paddled pass me making waves over my reflection. Not that it mattered that much, the background is full of stuff that couldn’t be edited out. It is obviously someone’s home or cottage. I tried to crop the image to just include the flowers but I found it didn’t work and so I just blurred the background which adds to the story. Thanks for coming along on my paddle down Kemptville Creek. It’s a very nice little creek, a little boggy in places but very little boat traffic which is what I like best. Click on the images to enlarge for better viewing. They can be very challenging. Ironically, I have gotten more pics of herons in the city then in their natural environment. I too spend most of my time watching them fly away from me. But last summer, I was very lucky and caught 3 different Herons. So keep trying, you just might get lucky. I love that last photo with a reflection. It’s so cool. I hope you enjoyed the exploration on a Kayak! I most certainly did. 🙂 It’s always helpful to know what people like, appreciate it! I THINK I SAW ONE OF THESE THIS WEEK…BEFORE THE WATER FROZE ON A NEARBY POND!!!! Thanks for the reblog. Helped me meet some new people.